Understanding statistics is a requirement for obtaining and making the most of a degree in psychology, a fact of life that often takes first year psychology students by surprise. 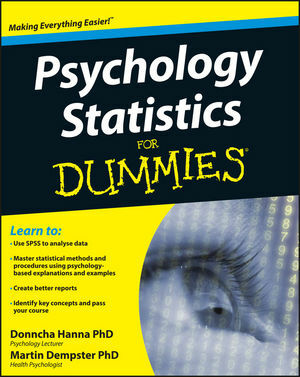 Filled with jargon-free explanations and real-life examples, Psychology Statistics For Dummies makes the often-confusing world of statistics a lot less baffling, and provides you with the step-by-step instructions necessary for carrying out data analysis. Donncha Hanna, PhD is a psychology lecturer at Queen's University Belfast whose primary teaching responsibilities include statistics and research methods. Martin Dempster, PhD is a health psychologist and the research coordinator for the Doctorate in Clinical Psychology programme at Queen's University Belfast.